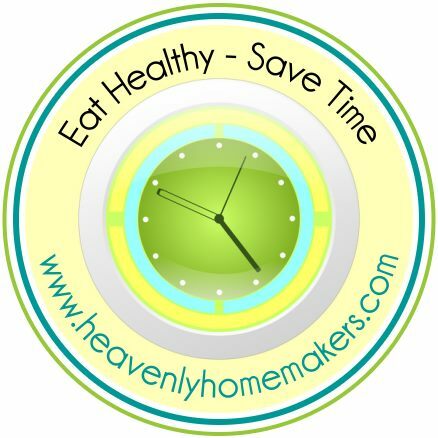 I was a part of an interesting conversation with friends recently in which some of us (including me) were saying, “If you’re going to cook one pound of ground beef, it doesn’t take any additional effort to cook ten pounds.” You know me – I’m always trying to convince people that cooking healthy food doesn’t have to be crazy time consuming. Especially when you practice the Cook Once, Eat Twice or More method. Ha! She makes a great point. So what do you think I went home and did? Well, I went to bed, because it was late. But then what do you think I did the next day? No doubt, I got eleven pounds of hamburger out to thaw. I had an experiment to do! Yes. I know. I’m a geek. Hey, at least I got 11 pounds of cooked meat out of the deal. I put ten pounds of meat into two separate pots because I wanted some with onions and some without. I began cooking the meat at 9:52. 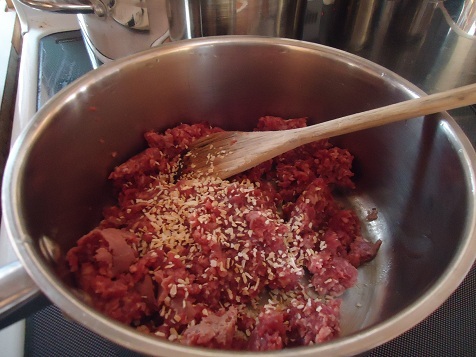 I find that cooking hamburger meat is quite easy. Every once in a while, I’d go stir it and break up the larger chunks. Otherwise, the meat is smart enough to cook all by itself. Therefore, while the meat was cooking, I mixed up Whole Wheat Tortillas and grated some cheese. If I was going to have eleven pounds of meat, well then, I was going to make some Meat and Cheese Burritos for the freezer. This was a quadruple batch of tortillas. No, I didn’t make them all while the meat was cooking, but I did get a good start. How long did it take for these ten pounds of meat to cook from start to finish? Drum roll please…23 minutes. I even surprised myself with that one. I thought it would take a little longer than that. By the way, I always took the lids off for the pictures, but I did cook the meat with the lids on. That always helps meat to cook more quickly, and keeps the flavorful juices from evaporating away! Next, I put one pound of meat into a pan and began to cook it. 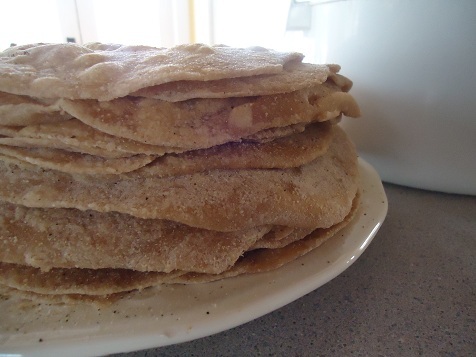 Again, in the meantime, I continued to work on that quadruple batch of tortillas I was making. From start to finish, it took 14 minutes to cook one pound of hamburger meat. What did I learn during this experiment? It does take slightly more effort to mush up the meat when cooking a larger amount, but barely. It feels so productive to get so many pounds of meat cooked at one time. What did I do with all of that cooked, ground meat? I made three meals worth of Burritos, two meals worth of Sloppy Joes, and three meals worth of “grab the cooked meat out of the freezer whenever you need it” meat. How do you usually cook your hamburger meat? In larger batches or just as needed? I was feeling kind of crabby and then I read this article. Your posts never cease to crack me up. I just think you totally rock and I have learned SOOO much from you. Thanks for being an awesome & hilarious blogger! Is it safe to thaw, cook and then re-freeze meat? Just wondering, I haven’t done that, I only thaw what I am going to eat for that meal. I always cook 10+ pounds in a session…some with onions, some with taco seasoning, some plain…then I divy it up into freezer containers…makes it so easy to throw together a last minute meal on busy days…home later than usual? no problem, stick a container of meat in with a container of spaghetti sauce and boil some noodles…morning get away from you and suddenly everyone is starving to death? no problem, pull out a container of taco meat and make some quick burritos…I’ve been doing this for years and wouldn’t do it any other way! Love your post as always. So I have always been a “batch” cooker. We had a huge sale on hamburger at our local grocery store about 3 months ago and I bought 40 lbs of meat. I had a plan and the day ended with me cooking the 40 lbs in 5 pounds increments in 2 pots. I made taco meat, spaghetti meat, sloppy joes, pizza casserole, cheesy beef and rice and beef burritoes. I kept out about 10 (1 lb) bags of cooked plain hamburger to throw into chili or whatever casserole I wanted on a whim. It has saved me a ton of time in the long run and my freezer was stocked for future use. I think batch cooking is the only way to go! I love cooking meat like this! 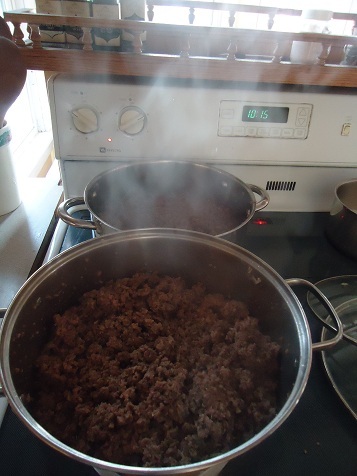 I often cook our ground beef in 5 lb batches and chicken in 3-5 pound batches. Since I buy in bulk, I can just cook an entire package instead of separating into smaller containers before freezing. I don’t pre-cook venison, though, since it tends to get gamey once it’s cooked and re-frozen. Too funny! I cooked up 15 lbs of ground beef today. But I did it in my oven. I crumbled it once in the pan (or in this case 3), turned on the oven and walked away. 15 minutes later I drained each pan and stuck it back in. 15 minutes later I drained each one again and it was done. So easy. Much much much better than doing one at a time! I do the large batches too – but just 5 pounds at a time. We’re a family of 2 adults and 1 9-month-old so that’s mucho for us. Then I freeze them again in smaller portions for whatever we have planned for meals later. It might not save much time overall, but it sure does save alot of time when making that one meal that I use the beef in. I do that with chicken too — “brown” up quite a few chicken breasts at one time to turn into dishes for pasta or chicken tacos or quesadillas later. I love to cook several pounds of hamburger at a time. Not sure what the time difference is but I usually boil it. Very easy. I have been cooking meat ths way for years too. 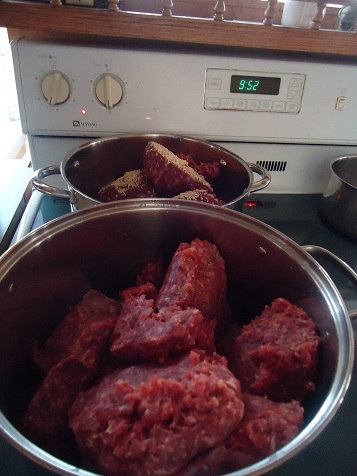 I then divide meat up and re-freeze in smaller packages. Plus, when I know it will be for tacos, hamburg stroganoff, sloppy joes, I put on a pair of gloves (don’t need to use gloves though) and take the hambur before it gets to hot in the pan, and roll it between the palms of my hands, to make it extra fine. I also take chicken breasts, and boil them. I actually have some boiled chicken in the refrigerator now, (from 2 days ago), waiting to be turned into chicken salad. Which I put in my Kitchenaid, put the paddle attachment on, turn on, and it shreds it in seconds…love doing it this way – no more cutting into bite size pieces….Kitchenaid does it better than me. Silly question, but can you tell me how you cooked the meat? I always put it in a pan and use a wooden spoon to stir it basically the whole time. This looks a whole lot easier. Do you put any water in the pot, or just put in the meat, cover it and put it on low, stirring occassionally? Thanks. I simply put the meat (by itself, no water or anything) in a large cooking pot. I brake it up a bit with a wooden spatula to get it going. I turn on the heat to about medium or a little lower. Then I put on the lid and let the meat cook for a few minutes while I’m doing other work. Then every few minutes, I stir the meat and break it up more with my spatula. I continue this process until the meat is cooked through and through. By the time I’m done, I have broken the meat into little bitty bits and it is just right! Do you drain the fat from the meat while it is cooking? I have found that my grass fed beef doesn’t ever need to be drained – it has the perfect amount of grease (or lack thereof). So I always forget to mention this! Yes, if your meat has extra grease, drain it off after you’re finished cooking it completely. Thanks. I cooked it this way tonight when I made taco meat. So much easier than how I was doing it before. I cook mine four pounds at a time because that is the very most my largest cast iron frying pan can hold. I never thought about doing it in my stock pot, which I would guess would work just as well, then I could add in an extra package or two! Brilliant! I buy ground turkey in a 3 lb package and then separet and freeze it. Next time, I’ll buy 2 packs and cook it all and feeze.Really wishing I had thouht of this before! When the price is great I buy as much as I can afford, and then cook, portion and freeze. Its a great time and money saver! We usually just do enough meat for whatever meal we’re making at the time. We eat meat infrequently I prefer using fresh meat when we do. I used to cook a bunch of meat at once and season then freeze when I cooked for my family as a teenager. Maybe someday my children will decide to eat more meat. Our almost 4 & almost 2 year olds refuse to eat any meat at all and our 12.5 year old will only eat a little every now & then. Eveb then he questions if it was ethically raised lol. I just wait until the meat has cooled to room temp, then put it into the freezer. Thank you so much. I have learned a lot from you. Thank you. I have a question about your tortillas (which I love and make all the time). Do you have any tips for making a quadruple batch? I tried that last time and wanted to cry by the time they were done. It took forever (like 3 hours I think)! I mixed it all then rolled in balls. Started them in my iron skillet (one at a time) and cooked while rolling out. I had tortillas everywhere! In balls, rolled out, in the pan, on a plate. I felt like I must be missing something because you do this regularly. I have a press but it doesn’t work very well-they are too thick and small. I think it just takes practice to make the process faster. I use a rolling pin for mine and have found that it’s much easier and faster for me instead of a press. The more you do it, the faster it will be I bet! Ha! I loved this experiement. While, yes, it is more work to cook, per pound, it’s much more time efficient. Thanks for proving this to all of us who sometimes get annoyed with always doing everything with grande, efficient output in mind. It is really worth it. For those who don’t mind plastic utensils, Pampered Chef makes a Mix and Stir (not a dealer here, promise), which is really great at chopping the beef into little pieces. My husband is rather particular about the size of chunks of cooked beef, just his “thing,” so I have found the most efficient way is to ask him to take care of cooking it – since he’s so good at it and all…. Love this post! Once again you rock! I tried the once a month cooking years ago and HATED it. I learned to cook in bulk or chop veggies in bulk and freeze in smaller bags. I always cook extra this way when making a meal. It is so great for tacos, sloppy joes, lasanga (a great one I can throw together on a Sunday morning) and cheeseburger bake just to name a few of our favorites. I do this also when I cook whole chickens in my crockpots(I have two 7 qt). I cook 2 chickens in each and then debone, make one meal for dinner and put the rest in smaller quart freezer bags for other meal like enchiladas, pot pie, chicken and noodles. It is easy and so nice when I need it ready to throw into a meal. I learned a few things from this post too! I didn’t realize covering it with a lid was the way to go, and kept the juices from evaporating. I’ll try that next time. I have also never considered using a stock pot, but that obviously makes good sense in bulk cooking. Also, the question someone had about draining the meat was one of mine too. But you say grass fed beef has the “perfect” amount of fat, or lack thereof. What is that exactly? If I am buying 90-93 % beef (the leaner/less fat) that is not grass fed is the grease from that quality of meat acceptable to keep, or still more than your grass fed beef? The last time I cooked only a small batch was because that’s all I had in the freezer ;) I use my turkey cooker in the oven and generally do at least 10 lbs at a time. My oven temperature varies (350 – 400) depending what else I’m putting in the oven at the same time. Depending on the beef, I may drain it midway through. Super easy! We just don’t like the taste of hamburger meat (hamburger is a patty between 2 pieces of bread) after it has been cooked then frozen – unless it’s already seasoned with taco seasonings. I agree that ground beef cooked and then frozen plain does taste “off.” If it is seasoned it is better though. It may also have something to do with how long it is frozen. Silly question, but how do you freeze the meat? 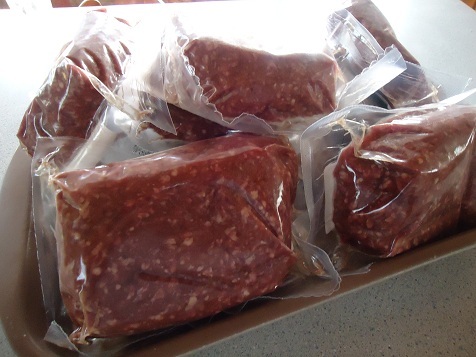 In freezer bags or do you have a vacuum sealer? If you do have a vacuum sealer would love to know what kind as I am looking into buying one. Thanks for the blog, I have learned so much! Laura uses freezer bags. Super easy! Do you all freeze it in one pound amounts? I have always wondered if one pound uncooked is the same as one pound of cooked meat…is that a dumb question?!? I would say a pound of cooked is a little less than a pound of uncooked, if you have grease to drain off. I do freeze it in one pound amounts – as best as I can, that is! :) Typically I get out ten freezer bags and try to divide it evenly. Or, I go ahead and use the cooked meat in a casserole or in sloppy joes and freeze it that way. I put 8-9 frozen pounds in a slow cooker and set it the dining room so its not taking up precious counter space…would probably be baking cookies and muffins at the same time :). I need to make 10ish pounds this weekend for a party where we will be having walking tacos. What size pots did you use? I need something big like that! When I am done, how do you suggest keep the meat warm until the party? A slow cooker? I plan to cook 9 lbs of ground beef in my Nesco 18 quart roaster oven. After it is fully done, I plan to rinse at least 3 times to get any excess fat off. Then I will dry the hamburger meat as best I can. Finally, I will put approximately 1 lb (or 1/9th of my total amount) onto each of my 9 dehydrator trays. I have an Excalibur dehydrator. I plan to make “Hamburger Rocks” which will last years when stored under vacuum with an oxygen absorber pad inside. I tested some to see if it was even worth it and put a small amount of my “Rocks” into some marinara sauce after first rehydrating with some boiling water. I could have simply thrown the “rocks” into the sauce while I was heating it up, as long as you have enough liquid in whatever dish you are making. TRULY AMAZING!! We are leaving on our boat for 5 months and do not have that much refrigerator or freezer space.